What is it? This so-called "double", "triple" and "quadruple" tests, which show those or other abnormalities of hormones during pregnancy. The word "screening" is translated as "screening", ie of all pregnant on the basis of these parameters. The main purpose of screening is to identify groups at risk of birth defects in the fetus. When I was pregnant for the first time with such a, Inot encountered. But a few years ago in the frame of reference includes two pregnancy prenatal screening - in I and II trimesters. Russian Ministry of Health Decree of 2000 requires antenatal clinics conduct biochemical prenatal screening of all pregnant women. How to go through all the complexities involved, and I want to share with the readers of our site. What is it? This so-called "double", "triple" and "quadruple" tests, which show those or other abnormalities of hormones during pregnancy. The word "screening" is translated as "screening", that is.e. of all pregnant women on the basis of these indicators. The main purpose of screening is to identify groups at risk of birth defects in the fetus - in particular, this is Down syndrome, neural tube defects, Edwards syndrome. The result is calculated by ultrasound readings and analysis of blood taken from a vein. Also to be considered, and the individual characteristics pregnant woman - Its weight, age, smoking, therapy hormonal therapy during pregnancy. Like many other women, I was worriedbefore the first screening - an ultrasound should look at the so-called RTA (nuchal translucency), whose figure in excess of 2 cm (some say 2.5 cm) indicates the possible presence of Down's syndrome in children. My baby turned out to be a fine fellow, but as it turned out, it does not mean anything. By the way, I want to emphasize that the RTA should be measured in strictly limited period of pregnancy - from 11 to 14 weeks, but the doctor-geneticist in Immunology and Reproduction Center told me that the more accurate the result will be taken up to 12 weeks, then the child already grows enough that in any case the neck size of the zone will not be informative. Blood in the I trimester of rent on two hormones - b-hCG and PAPP-A. For screening II (16-18 weeks) ultrasonography You can not do - take the indications for screening made from the previous time. Blood rent already three hormones - b-hCG, AFP and free estriol ( "triple test"), as an option, there is a fourth component - inhibin A. So, analyzes and ultrasound done, and now you're waiting forresults. In the women's clinic they have to wait a long time - up to three weeks, if you are going through their own screenings in laboratories paid, the result can be obtained quite quickly - it's a matter of one or two days. And then, finally, a sheet with the results with you. It listed the numbers against each indicator. But in order to properly compare the performance of their expressed not in absolute terms, and IOM (the multiplicity of the median). 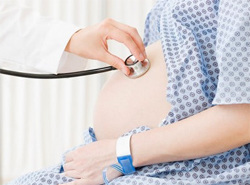 Med - is the average figure for the marker for a stated period of pregnancy. MoM norm is in the range of 0.5 to 2.0. Deviation from these numbers indicates the possibility of pathologies. Yes, that's what happened with me and. My performance did not fit into the norm. Having studied sources (it turned out that, unfortunately, not so much), I found that the loss of the standards can mean almost anything. Increased hCG may indicate chromosomalmalformations, but also about multiple pregnancy, and rhesus conflict. But the decrease in hCG can be ectopic pregnancy, miscarriage threat, not developing pregnancy. Raising and lowering the AFP will be talking about possible defects and fetal chromosomal abnormalities. Moreover, the presence of pathologies should speak and the combination of deviations in terms of hormones. In the case of Down's syndrome, for example, the indexAFP understated and hCG - above the norm. Unterminated neural tube, on the contrary, is the hallmark of an increased AFP and hCG reduced. But Edwards' syndrome is characterized by reduction of these hormones. And based on these indicators on a piece of paper withresults in large letters written screening - high or low risk. The parentheses indicate the ratio, for example, 1: 100,000, or, sad, 1: 130 or 1:60. This means that 100,000 women under the same terms of 1 child is born with this malformation. The lower limit of the ratio is 1: 250, ie, a figure below 250 would indicate a high risk of having the disease. When you specify a high risk doctor femaleconsultation shall send you to the doctor-genetics. Here you have to take an important decision for you. Perhaps the most important thing in life. Unfortunately, malformations, at which point the risks - not treatable. You only get the opportunity to know whether you have a "not so" child. Geneticist again look at all the numbers, askYou about your ancestry, about whether you accept hormonal treatment during pregnancy (in particular, many to save the pregnancy take Utrozhestan or Djufaston that just cause an increase in the level of the most hCG in the blood), but be sure to tell you that NO no means to know exactly the presence of abnormalities in the child, except for invasive research. Screening refers only to the possibility of havingproblems, but as we found out, the deviation in the readings can be caused by incorrect or undelivered time analysis or metering TVP or overweight mom, or give it preserving treatment. A detailed expert ultrasound aimed at a careful study of the so-called pathological markers, unfortunately, also does not provide an absolute guarantee that there is or is not a terrible disease in your child. And in that case, if your risk is too high,geneticist will offer you an invasive test (invasion - penetration): chorionic villus sampling, amniocentesis (sampling amniotic fluid) or cordocentesis (puncture of the fetal umbilical cord). Depending on the type of study they conducted on different dates. There is already up to you. Invasive studies - entirely your decision, your doctor may only recommend their implementation. Do you need to know for sure whether it is necessary for you? Yes, certain risks in conducting suchthere are procedures. In the opinion of physicians, it is estimated according to the method of 2-3 to 0.5%. But if you decide to do such a study, search our site recommends a place that specializes in these procedures - the doctors there a lot of experience, qualifications, "packed full of hand." Bonus in this study will be the exact news that - who is there, who is waiting for you at the end of the path - a boy or a girl? When counting the chromosomes mistakes do not happen. Summing up, I regret to say thatscreenings is little information. If you use the term "screening", that uses a sieve with very large cells. The fallacy of noninvasive studies is quite high. Even not all doctors are positively assess their conduct mandatory. Too scary topic, worry too much, and do not sleep at night expecting mothers, expecting results or trying to make the right decision. I myself cried for a month at night, trying to understand and interpret screening results and looking forward to counting chromosomes ... But I have a daughter. No, now I have two daughters! And I hope and believe that over time, non-invasive screening will be informative and such studies will help my daughters to be happy moms.